The trouble with having everything you ever dreamed of is this: When people ask me what I want for my birthday or for Christmas, I end up saying, "Nothing. I have all that I need." Or I say, "Just give gifts to my Vito. I'm okay." But of course I want stuff. Don't we all?! It's just that the stuff I want entail a lot of money so it's kinda embarrassing to tell people, "Well, actually, I'd love it if you gave me this-and-that!" 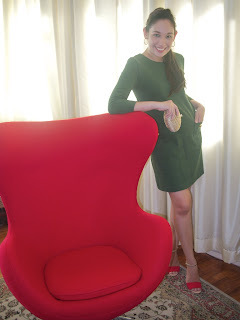 The green Mango dress. Because I look fab in it and everyone agreed! So obviously I should have that darling dress in my possession! A wrist watch. Someone sent me a link to some Michael Kors watches and I was suddenly reminded that I used to be a watch girl. Yep, before I had a baby, I felt absolutely naked without a watch. Then Vito came along and watches and bracelets and bangles became part of my other life. I actually already have quite a number of lovely watches. But I want a new one. Maybe a Philip Stein one. A weekend (or maybe the entire holidays!) away. Preferably at Tagaytay, ensconced in a log cabin with my hubby and little boy! It's just too hot in Manila. What is up with this strange weather?! New shoes. I'm going to sell all my pre-preggy shoes on eBay. I don't think I'm the sky-high heels kinda girl anymore. So I want new ballet flats and will try something I have never ever worn before: kitten heels. Uh-oh. I think that, yep, I am finally a mommy! A curling iron. After I read The Picky Dresser's easy tutorial on how she gets perfect hair every single day, I vowed that I should have that Vidal Sassoon Ceramic Instant Heat 32mm Iron! O.P.I. nail polish. I have nice nails so I love a good mani-pedi to show them off. Here I'm wearing Glitzerland. This was the year that I became a nail polish snob, by the way. Used to be any drugstore brand was okay but ever since I discovered fabulous (and expensive) nail polish, there was just no going back for me. I always bring my own bottles of polish to the nail salon and I want more! A pearl set. I want a single strand golden pearl necklace and a matching pair of earrings. Because I'm 35 years old and I should have something that classic and perfect in my jewelry box! I can think of more! Since I've been a very good girl this year, I do believe I deserve some lovely treats. But let's leave the list at that because, well, I do have everything I need and more! With my darling husband and baby boy, our wonderful home, our health, life is beyond fabulous. And I don't want to be too greedy. So... okay, I'll be happy with the nail polish! What's on your dream gift list? Do share! Maybe I can add your wish to my list! P.S. Still shopping for gifts? I highly recommend you read my Topaz Horizon Gift Guide! lovin' the nail polish! that's a really nice colour on you. do you also do nail art? hello! Ms. Frances, I do have also my "yearly Christmas Wish", hahaha! but last Saturday night,1 is off my list because my husband is kind enough to give it to me. an iPad2. hehehe! siguro 1 or 2 more na lang, 1 pair of FitFlops and money for shopping spree. hehehehe! PS: I love your Nov 2011 Power Couples issue! I finished it in one sitting! I want a birthing ring/push present after giving birth this coming February. :) I'm interested with your pre-preggy shoes, care to share your ebay seller name? like the rest of them, i so love that green dress on you. :-) hope you do buy it for yourself! but i agree, you look dee-vine in that green dress! not that i have a lot,mind you! the only green things i own are my nail polishes! & don't get me started on polishes...im a certified polish addict, though i try not to show it on my blog...hahaha! i also bring my own bottle of polish when i go to salons! i remember when i brought chinaglaze gr8 at a salon, the people bombarded me with lots of questions where i bought it. i became a star in an instant..LOL!